Located on Magudhuva island within the southern rim of the Huvadhu Atoll, Ayada Maldives Luxury Resort is just a few kilometers from the equator. If warm sunny days are what you desire, the equator — and Ayada Maldives — will provide! Ayada Maldives has 122 villas and suites with the standouts being the traditional thatch-roof overwater bungalows perched on the resort’s lagoon. Overwater hammocks and glass viewing panels in overwater bungalow floors make leaving your room less-than-desirable. Private pools in the overwater bungalows are the perfect spot for the resort’s floating breakfast option. Magudhuva island is dotted with gardens and tropical greenery and ringed with beaches. The coral reef that encircles the island is frequently visited by dolphins and that reef, along with others nearby, are some of the least visited snorkeling and diving sites in the world. Some of the best surf breaks in the Maldives are just a short boat ride away. The stand-out excursion option at Ayada Maldives is the Equator Crossing trip. Weather dependent and not for those prone to seasickness as the waves, can be a bit rough, this boat trip takes you there and back again across the equator and gives you a souvenir signed certificate to impress all your friends with. Or take a sunset sail in a traditional Maldivian wooden boat and give traditional Maldivian fishing a try. Catch your dinner and the chef will prepare it fresh for you the following day. If you want to spend some time getting your land legs, hit up movie night by the pool, Las Vegas night, or management’s cocktail hour. The resort has eight bars and restaurants ranging from an International Buffet with changing daily themes to Ocean Breeze, an overwater restaurant, and bar. Enjoy a beach BBQ under the stars at Sea Salt, traditional Turkish cuisine at Ottoman Lounge, or wine and cheese at Ile de Joie, a cozy open-air restaurant set over the lagoon. In-villa and private dining experiences are also available. AySpa features eight private treatment villas, some with their hydrotherapy baths. The expansive spa also boasts a Turkish Hammam, as well as a cold plunge pool and a warm vitality pool and the boutique stocks ESPA products. 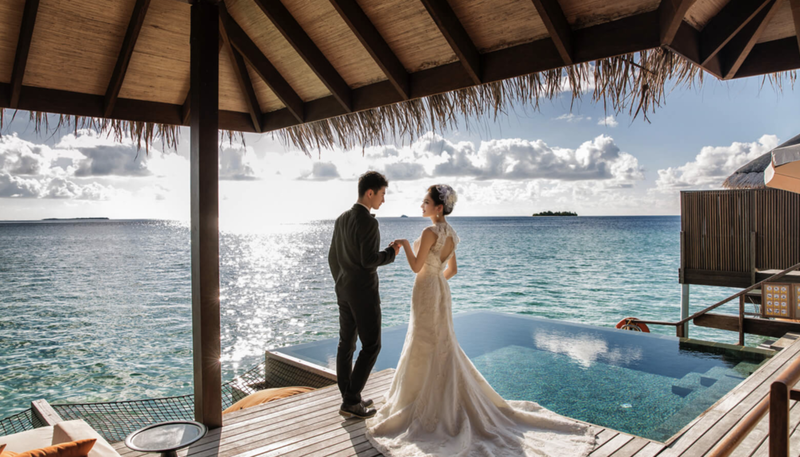 Whether it’s a wedding or a vow renewal on their white sand beach or their exclusive White Room pavilion, Ayada Maldives offers endless options including traditional Body Beru drummers, Maldivian lover coconut sharing, in-house photography, Maldivian officiants, and more. Fly to the Maldives’ Male International Airport and take a 55-minute seaplane flight on Maldivian Air, the local domestic carrier, to Kaadhedhoo Domestic Airport. From there it’s just a 50-minute boat transfer to Ayada Maldives. Sunscreen because the rays are fierce that close to the equator! Many products featured on this site were editorially chosen. Beaches, Booze, and Bungalows may receive financial compensation for products purchased through this site.